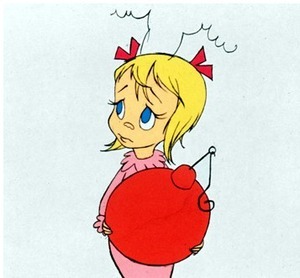 Part of me hopes that whoever stole my purse did it with good reason, kind of like how the Grinch stole Cindy Loo Who’s Christmas tree. Remember? She asks him why he’s taking her Christmas tree away, and he tells her that there’s a light out, so he’s going to take it to his workshop to fix the light and when he’s done he’ll bring it right back. Granted the Grinch was lying when he said those things, but still. I know that the front magnetic button on my purse was broken and ripped underneath, so maybe the “thief” saw it and was like “Hey! I’m a professional button-fixer. It would give me joy to fix her purse, but I don’t know how to introduce myself so… I’ll take it to my workshop and bring it right back to one of the 23 Lost and Found locations in the area. It’ll be great”. Honestly I’m just glad that the thief picked a day that was mostly insignificant in my life to steal my purse rather than my birthday like the last time my purse was stolen. I was a senior in high school working on my birthday as a mat-maid for the varsity wrestling team (it was a dignified job, I promise). We were in a gym for a huge wrestling tournament, and I had to be on the mat to keep score so I left my purse stuffed underneath all of my team’s bags in the bleachers. When the tournament was over I went to fetch my purse and it was gone. I was frantic and threw the wrestlers’ bags all over the place trying to find it. I ran to security who made an announcement over the microphone describing my purse in case anyone spotted it before leaving the gym. In a way it was a small birthday gift to myself because suddenly all of these hunky wrestlers from different schools came up to me and asked me questions about where I was when I noticed it was gone, where I had put it, if I had seen anyone suspicious, how I was doing in this moment of crisis. I may have done some hair flipping and eyelash fluttering, but still I was too upset to do any real damage. Finally someone found my purse – ON THE FLOOR OF THE BOYS BATHROOM. I was so grossed out. It was on the floor! In a stall! Whoever found it brought it to security who then called me over to him. My purse was wide open – cards, receipts, pens, lady things were scattered in a giant mess. Every pocket had been opened and searched. The thief left my phone, license, and credit cards, but took my glasses, mini iPod, my friend’s mini iPod, 7 gift cards ranging from $25-$75, and all of my birthday money. In all I probably lost close to $800, the large portion of that being of course the Apple products and my glasses. But, you know what? Those were all just possessions, and one by one I did end up getting some of those things replaced. My birthday still rocked and I met like 50 muscular wrestlers that day, so, win-win! This time around, my husband came running (by U-Bahn) to my aid and I only lost 7 euro or so (which I’m pretty sure the police officer judged me for). The only other things in my purse that I can think of were my special Altoid container I made with Tamika, my last bottle of Dramamine, some pens, my keys, and my BIPA card (a card that gets me discounts at my local BIPA store). So, he or she can enjoy my broken purse and next-to-nothing in it. The credit cards are shut down and Will and I have been going around Vienna to get my necessary cards replaced, like my transportation card, ÖBB card, etc. Oh and my Zoo Pass was in there! Ughh that’s frustrating. The pass gets me into the Zoo for free which WAS fabulous. Guess we’ll be heading to the Zoo this week too. Happy Thursday friends, and hang onto your belongings – there’s thieves afoot!